The assailant shot dead a policeman and a civilian at the entrance to the Reina club, one of the city's most exclusive nightspots, and then went on a shooting rampage inside, Turkish officials said. Interior Minister Suleyman Soylu said the attacker escaped and was now the target of a major manhunt, expressing hope the suspect "would be captured soon". Soylu said in televised comments that of 20 victims who have been identified so far, 15 are foreigners and five are Turks. Another 69 people are being treated in hospital. "The attacker -- in the most brutal and merciless way -- targeted innocent people who had only come here to celebrate the New Year and have fun," Istanbul governor Vasip Sahin said at the scene on the shores of the Bosphorus. Many revellers threw themselves into the water in panic and efforts were under way to rescue them, NTV television said. Dogan news agency said earlier there were two gunmen dressed in Santa Claus outfits, although this has yet to be confirmed. Soylu said in his latest remarks it appeared there was only one gunman. Television pictures showed party-goers -- including men in suits and women in cocktail dresses -- emerging from the nightclub in a state of shock. Sahin said the attack began at 1:15 am Sunday (2215 GMT), just after hundreds of revellers had seen in 2017 at the club in the Ortakoy district on the European side of the city. "What happened today is a terror attack," he said. Dogan reported that some witnesses claimed the assailants were "speaking Arabic" while NTV said special force police officers were still searching the club. From Sydney to Paris, Rio to London, security had been boosted over fears that the New Year festivities could present a target for violent extremists. In Istanbul, at least 17,000 police officers were deployed and some, as is customary in Turkey, dressed themselves as Santa Claus as cover, according to television reports. "Just as we were settling down, by the door there was a lot of dust and smoke. Gunshots rang out. When those sounds were heard, many girls fainted," professional footballer Sefa Boydas told AFP. "They say 35 to 40 died but it's probably more because when I was walking, people were walking on top of people." Dogan said there were at least 700 revellers at the elite club, where getting past the bouncers who seek out only the best dressed is notoriously hard. Turkey has been hit by a wave of attacks blamed on Kurdish militants and IS jihadists and 2016 saw more attacks than any other year in the history of the country. On December 10, 44 people were killed in a double bombing in Istanbul after a football match hosted by top side Besiktas, an attack claimed by the Kurdistan Freedom Falcons (TAK) seen as a radical offshoot of the outlawed PKK rebel group. And in one of the most brazen strikes, an off-duty policeman assassinated Russia's ambassador to Turkey in an Ankara art gallery less than two weeks ago. "No terror attack will destroy our unity, or eradicate our fraternity or weaken Turkey's effective fight against terror," Justice Minister Bekir Bozdag wrote on Twitter. Mainly Muslim Turkey's religious affairs agency Diyanet condemned the attack, saying the fact it took place in a nightclub "was no different to it being in a market or place of worship". Turkey is still reeling from a failed July coup blamed by the government on the US-based Islamic preacher Fethullah Gulen that has been followed by a relentless purge of his alleged supporters from state institutions. 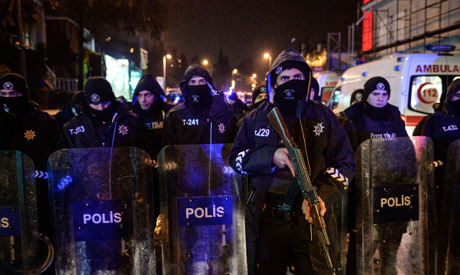 "Tragic start to 2017 in Istanbul," NATO Secretary General Jens Stoltenberg wrote on Twitter. The White House condemned the "savagery" of the attack, with National Security Council spokesman Ned Price saying that Washington reaffirmed its support for its NATO ally "in our shared determination to confront and defeat all forms of terrorism". The US embassy warned citizens that extremist groups are continuing "aggressive efforts to conduct attacks in areas where US citizens and expatriates reside or frequent." Turkish President Recep Tayyip Erdogan, who is in Istanbul for the New Year, had been informed of the attack, local media said. The shooting spree came as the Turkish army wages a four-month incursion in Syria to oust IS jihadists and Kurdish militants from the border area, suffering increasing casualties. As is customary after such attacks in Turkey, the authorities slapped a broadcast ban on images from the incident.